Minerva Arts was set up in 2009 by Steph Brocken and Hayley Wood, two ex-students of the University of Chester. The company was founded with an interdisciplinary ethos, drawing on their backgrounds in Live Performance, multimedia technology and visual arts and crafts. Minerva took over the former Chester Gateway Youth Theatre from Off The Ground in April 2011 and since then have developed three additional groups creating unusual and contemporary performance right across Cheshire West. In the past two years Minerva has expanded to develop and fundraise for our own projects. In 2013 we were successful in gaining Grants for the Arts funding for the Arts in the Villages project and we had further success with achiving funding for the first phase of the Lynk Cheshire Project in 2014. As well as this, we partnered with River Niger Arts in 2013 to win funds from the Heritage Lottery Fund to create the Wirral to West Africa project and were then again funded by the Heritage Lottery Fund to create the Souling project. For information on all these projects, head to our Archive page. Minerva Arts is all about enabling young people to have access to the cutting edge of performance and art, creating unusual experience that have positive processes and relationships at heart. We believe that this is true of all our work from our Youth Theatres to projects with school and community groups. Steph is Minerva Arts Artistic Director. She co-founded the company in 2009 and has been running it solo since 2011. She is a graduate of the University of Chester having gained a BA (Hons) in 2009 and and MA in 2010. 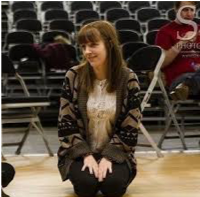 Steph has been working in the arts with young people for twelve years having started her career at the Chester Gateway Theatre after badgering Youth Theatre Director Jim for a job over her gap year. After the closure of the theatre she went freelance and has never looked back. She now works for Peshkar as their Arts Award and Engagement Manager as well as regular freelance work for Street Style Surgery and Manchester Histories. Hollie is the Youth Theatre leader for the Malpas group. She started in September 2014, researching and developing Minerva Arts Youth Theatre provision and successfully set up Malpas Youth Theatre. She graduated with a MA in Applied Theatre from the University of Manchester in 2012 and is also the Co-Director of Express Arts in Warrington. Hollie also freelances for Tramshed Theatre and Bluestreak Arts on a regular basis. She has worked with many age groups of different abilities and finds nothing more rewarding than building people’s confidence through drama and creativity.